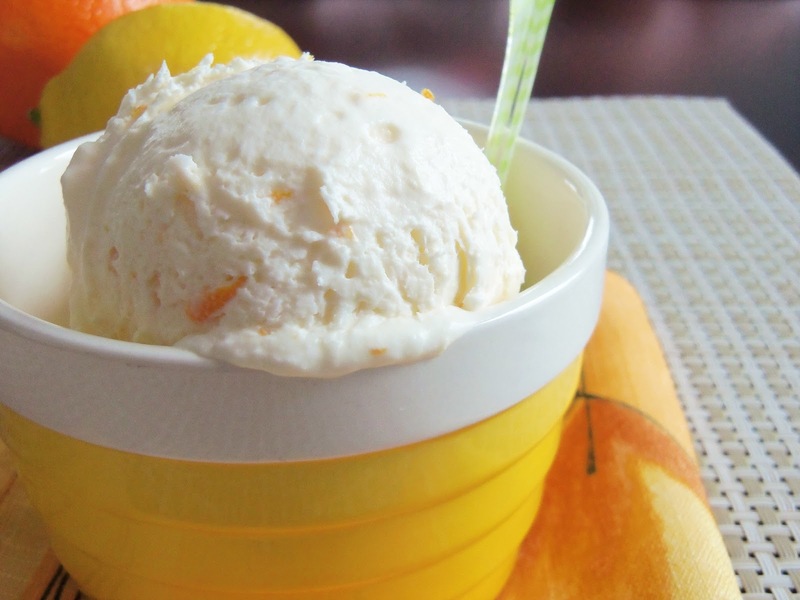 Don’t you just love homemade ice cream? I know what you’re thinking; here we are, shivering in single-digits temperatures and talking about ice cream. That sounds kinda out of place but no cold season will ever keep me away from ice cream. After all, it’s summer in the southern hemisphere! 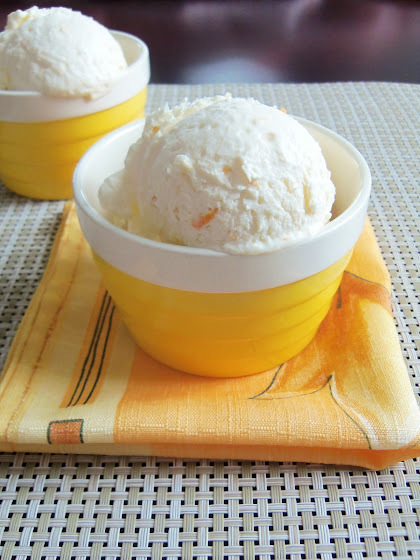 Truth be told, I’m a bit of a lost case when it comes to ice cream; I usually avoid stuffing the freezer with this temptation since I’m pretty shameless once I get my paws on it; and I could eat it by the ladle and finish the container in one sitting! Ice cream has that effect on me. It goes without saying that after I’m done I’m left with a mountain of regret for not being able to control myself. What can I say – I’m not perfect. Anyway… For someone who loves ice cream as much as I do it took me forever to get serious and finally take a stab at making my own. So on Black Friday, we acquired an ice cream maker. Hooray!!! It had been on my to-buy list for quite a while. Now, you would think that I immediately made tons of ice cream once we got it. Not so much… In fact, the poor thing is still comfortably sitting in the box. Yep… I have yet to take the ice cream maker out of its box. Shame on me! 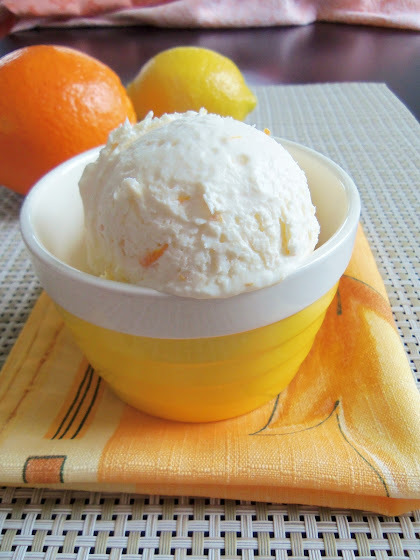 But that hasn’t stopped me from making homemade ice cream. 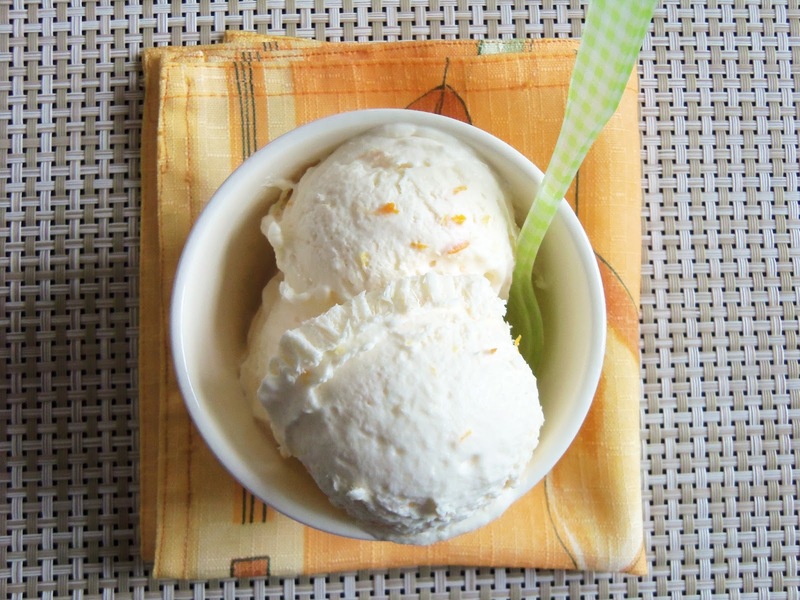 Which brings me to my next point: sometimes, there’s no stirring, churning or an ice cream maker required to create wonderful homemade ice cream. 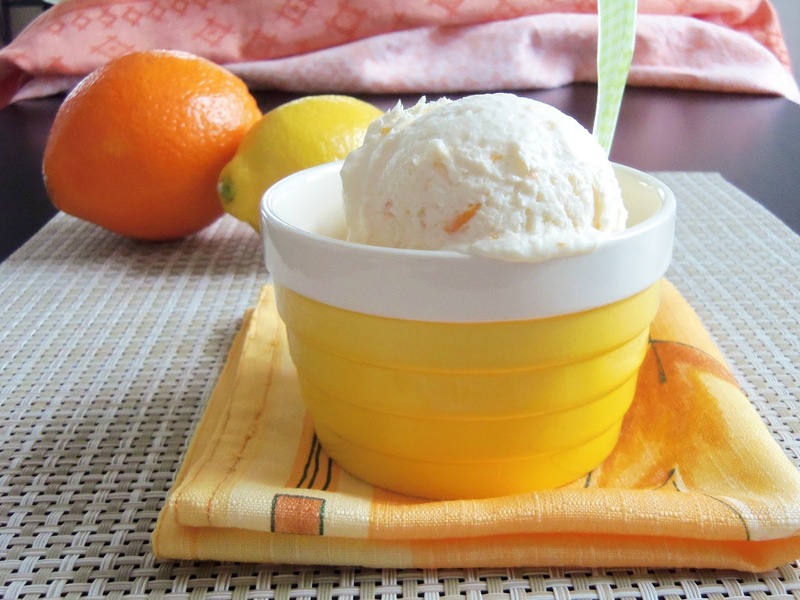 And this fantastic Orange-Lemon Ice Cream is here to prove it. I don’t even know where to begin. Maybe I should start by telling you that there are only four ingredients in this recipe. FOUR! But that doesn’t emphasize how magnificent this ice cream is. 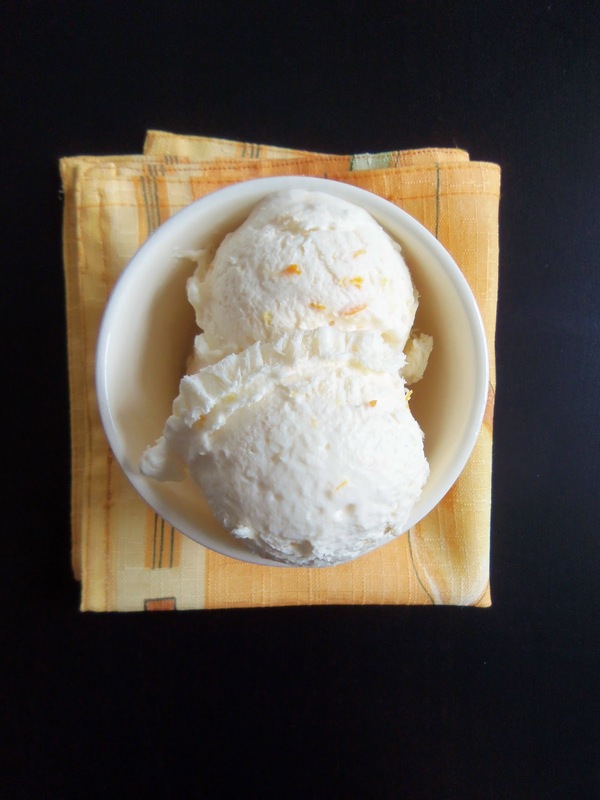 It’s so stunningly delicious, creamy and smooth yet light at the same time with brightly colorful orange and lemon specks that enrich the lovely texture. 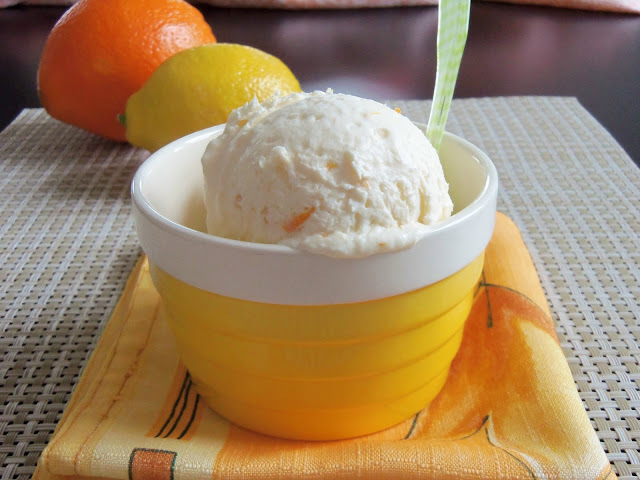 One spoonful and your mouth will be coated in an explosion of glorious and sweetly citrusy aroma. 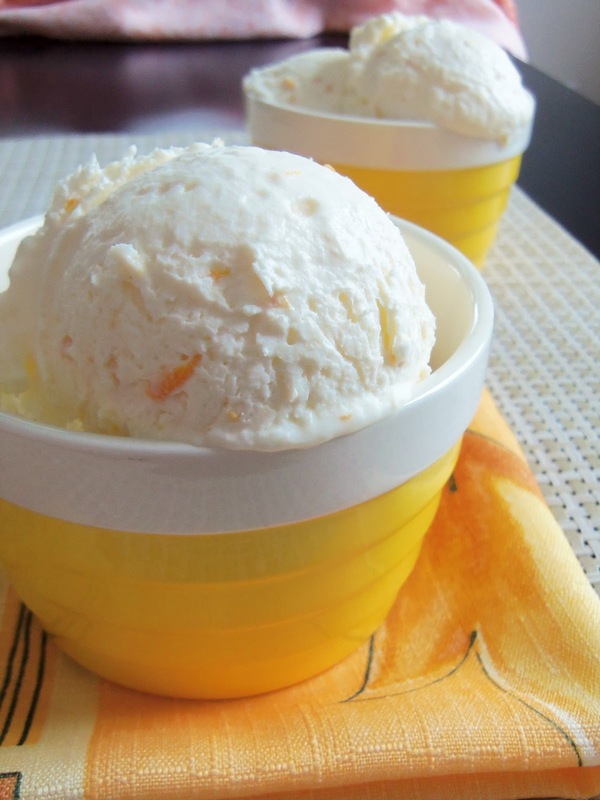 This ice cream is splendid on its own and it’s also a ravishing topper for any bread pudding or a slice of warm, moist cake or whatever dessert you might want to dress up. 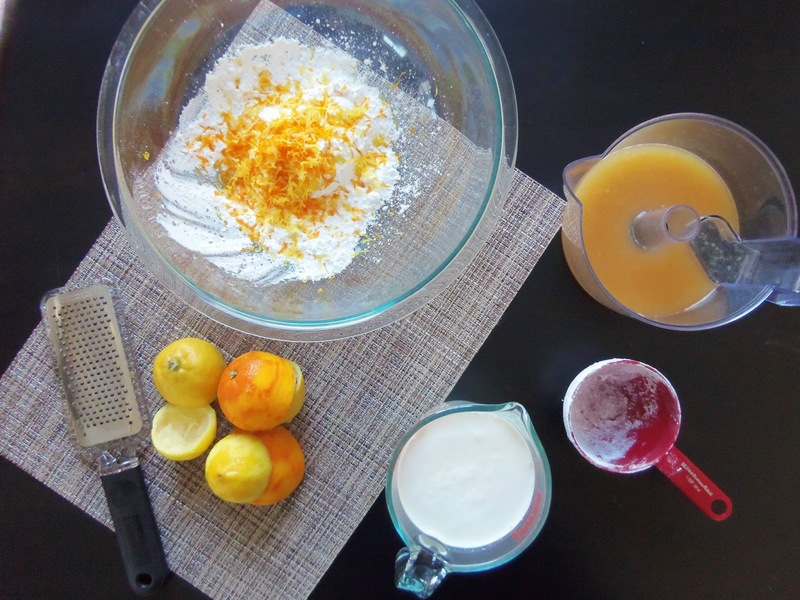 Grate the zest of the orange and one of the lemons. 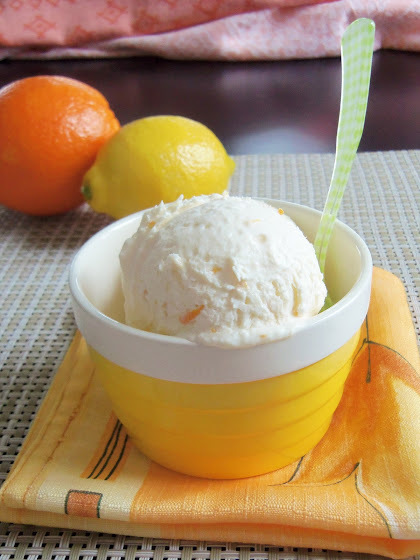 Squeeze the juice of the orange and the two lemons and pour into a large bowl with the zest and confectioners’ sugar. Stir to dissolve the sugar and add the heavy cream. Using an electric mixer on low speed, whip everything until it holds soft peaks. Pour into a shallow airtight container (of approximately 2 quarts) with a lid. Cover and freeze until firm (from 3 to 5 hours). Remove to ripen for 15-20 minutes (or 30-40 minutes in the refrigerator) before eating. 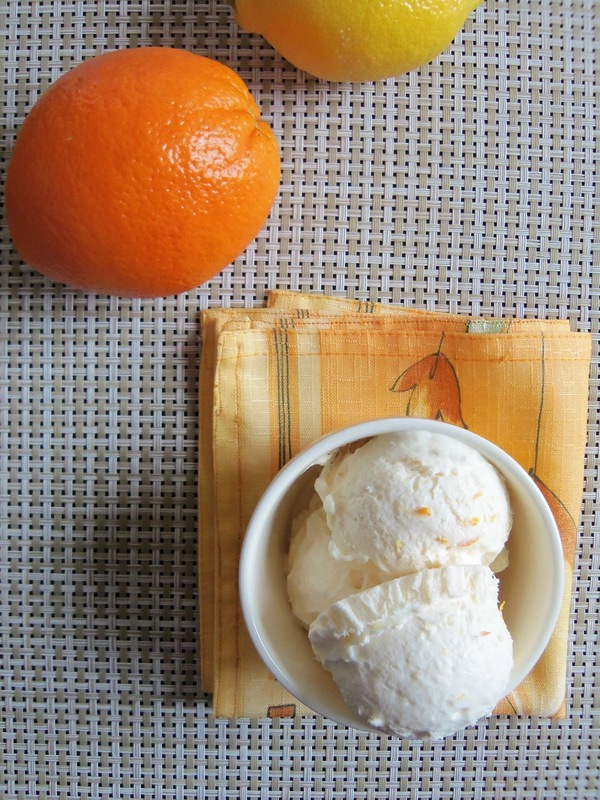 Serve in a bowl, in cones, with wafers – however you like. P.S. : I do solemnly promise to take the new ice cream maker out of the box and use it to make fancy superb ice cream before too long. Do you know what I love to bake in wintertime? 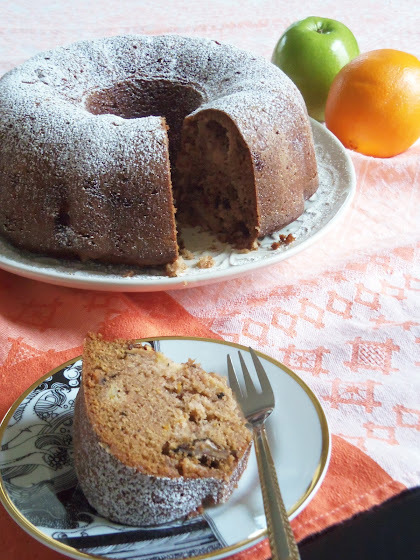 Cakes that are rich, dense and full of warm winter spices; and I usually prefer the ones baked in a Bundt cake pan. I like that ridged and elegant shape given by the Bundt pan, and I always get such a thrill when I see the final product out of the oven. 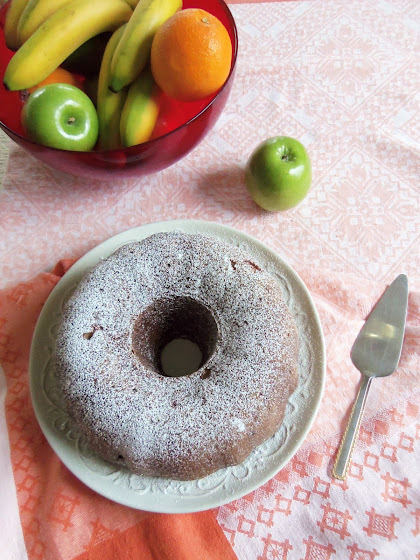 I feel that the Bundt shape makes the cake extra-special and so appetizing. 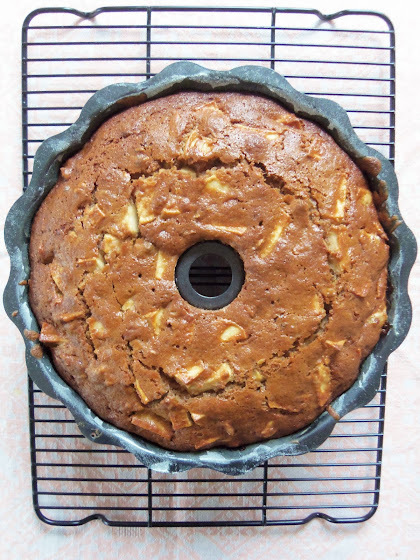 Truth be told, I wasn’t very versed in the Bundt pan world until a couple of years ago when I saw Giada De Laurentiis, one of my ultimate favorite celebrity chefs, bake this delicious Spiced Apple-Walnut Cake for a casual family Thanksgiving dinner. Still, the history behind the beautiful Bundt pan remained a mystery. But I’ve recently discovered an interesting article on Bundt cakes in Food & Wine (December 2012), which shed more light on this topic and enriched my knowledge of the famed tube pan. Ella Helfrich, a Texas housewife, who won second prize with her Tunnel of Fudge Bundt cake at a Pillsbury bake-off in 1966, helped galvanize the Nordic Ware brand. And by the way, did you know that Nordic Ware created the Bundt pan as an economical aluminum version of the traditional European kugelhopf mold? I didn’t have the faintest idea and was even more surprised to learn that the Bundt cake is also popular in Romania. We live and learn. 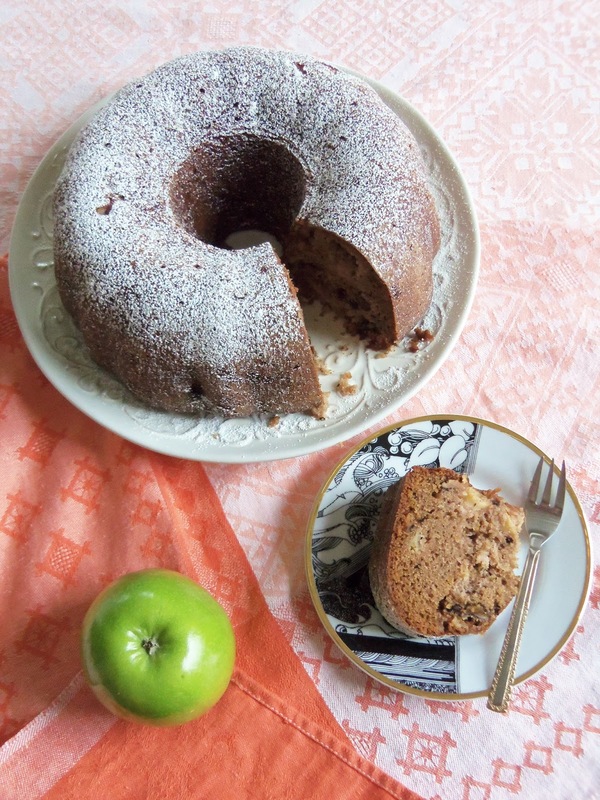 Giada made her cake for Thanksgiving; but frankly you don’t need a holiday excuse to bake this stunning cake. 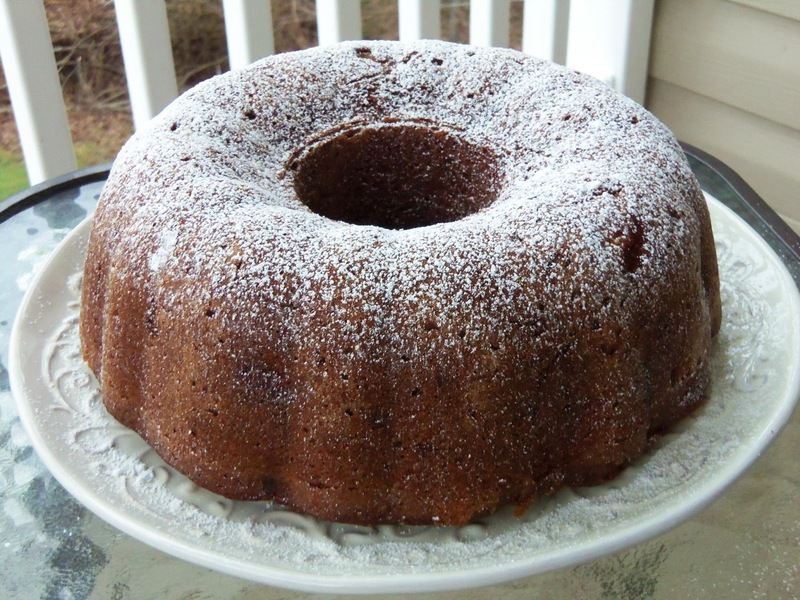 Winter is still here and Bundt cakes are so entertaining and ideal for the cold season. And this cake will dazzle you from the first bite. It’s so moist, smoky, a tad citrusy, loaded with heady winter flavors, and studded with generous chunks of apples and toasty walnuts. 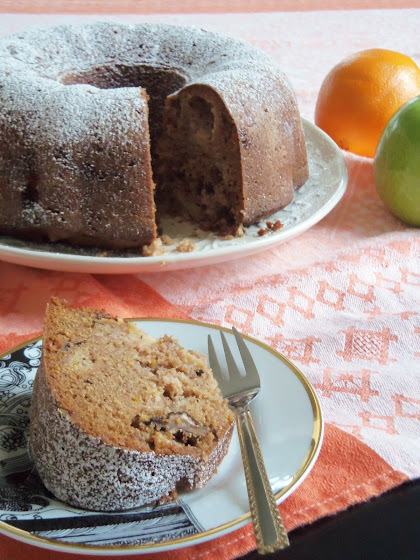 This cake is a superb dessert on its own, and scrumptious with tea or coffee for breakfast or a lazy afternoon snack. Now if you’ll excuse me, I’ll go devour a slice! Place an oven rack in the center of the oven. Preheat the oven to 350°F. Liberally butter and flour a 10-inch fluted tube or Bundt pan. Set aside. In a large bowl, mix together the apples, maple syrup, eggs, sugar, oil, vanilla extract and orange zest. In a separate medium bowl, whisk together the flour, baking powder, baking soda, cinnamon, nutmeg, ginger and salt. 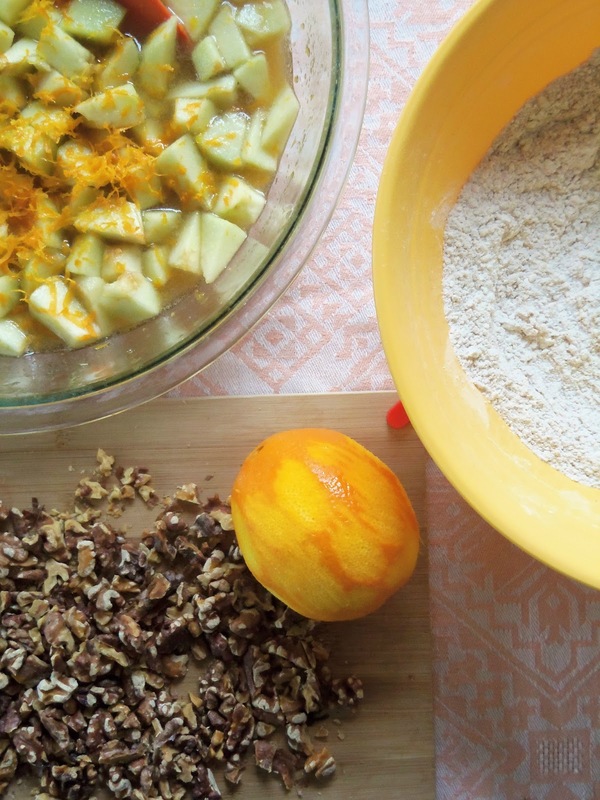 In batches, mix the dry ingredients into the apple mixture. Stir in the walnuts. Pour the mixture into the prepared pan and bake until a cake tester or skewer inserted into the cake comes out clean, 60 to 70 minutes. Cool for 15 minutes and invert on a plate or wire rack to cool completely, about 1 hour. 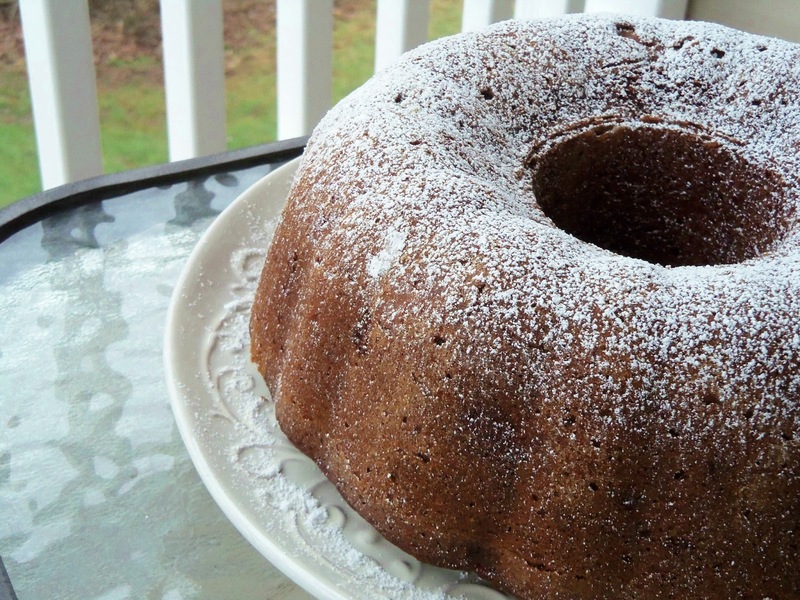 When the cake has cooled completely, dust it with confectioners’ sugar. In a food processor, combine the confectioners’ sugar, heavy cream, cream cheese, 3 Tablespoons water and vanilla extract. Process until smooth, adding more water, 1 teaspoon at a time, until the icing is pourable. Spoon the icing over the cake and allow to set for 20 minutes before slicing. 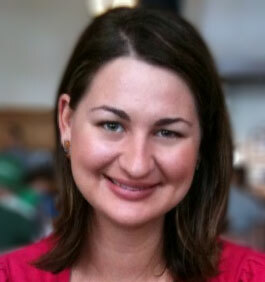 I know what you’re all thinking – how can I start the New Year with a restaurant review? Well, perhaps I’m still craving some super-rich, over-the-top food after the holidays since a detox diet hasn’t yet made my resolution list; but maybe I’m just craving some fine food and someone else to cook and serve it to me in a sophisticated and upscale ambiance. And besides, I’m way overdue with a restaurant review. So here you have it! Not so long ago, I introduced you to the memorable SW Steakhouse, so I’ll continue with the Las Vegas theme, and talk about Botero restaurant at Encore Hotel and Casino in Las Vegas. In recent years, Adrian and I have become fascinated with the fine dining offered by the Wynn | Encore Resort. 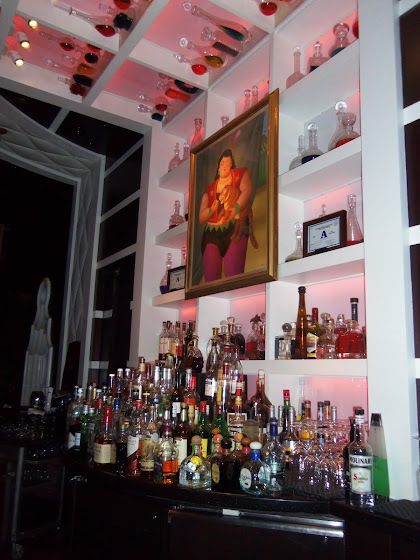 And Botero is one of those restaurants that shouldn’t be overlooked especially if you’re at the Wynn | Encore Resort. First and foremost, the restaurant is named after the world-renowned Colombian artist Fernando Botero, an acclaimed painter and sculptor. That’s why some of his paintings and sculptures are displayed throughout the restaurant giving the décor an artsy and trendy yet elegant feel. 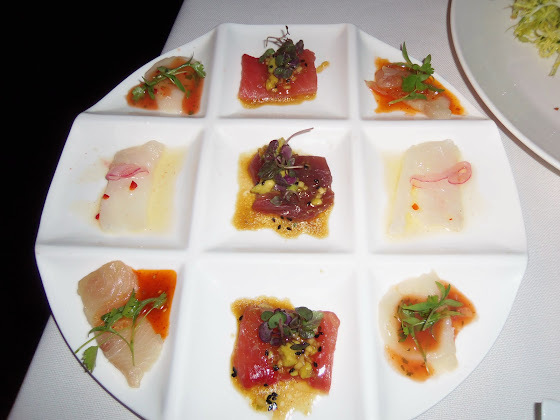 Second, the ingenious dishes and the combination of flavors that Chef Mark LoRusso creates make Botero restaurant a true gem; not to mention that the restaurant received the AAA Four Diamond Award. 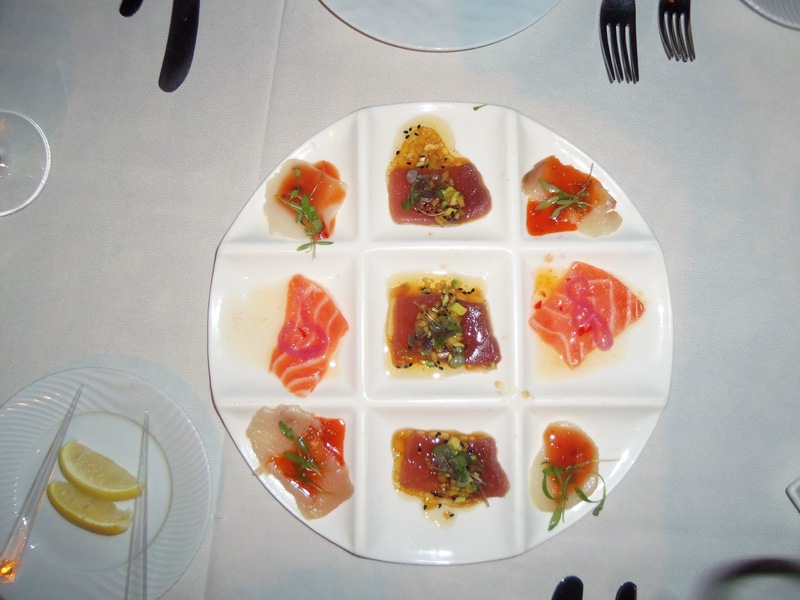 We always start our dinner with the Crudo Tasting. We just can’t skip over this simple yet so light and tasty assortment of fresh fish. This appetizer offers bite-size lacy slices of fresh tuna (3 pieces), scallop (2 pieces), salmon (2 pieces) and hamachi (2 pieces). All the pieces of fish are well-seasoned and marinated in shallow pools of sauces and herbs; some sauces are sweet, some are tangy, and some are a tad spicy, just enough to add a nice subtle kick. So flavorful and perfect for sharing! The Caesar Salad is a generous pile of crisp lettuce, crouton chips, shaved Parmesan and light dressing. But the rolled and fried crispy anchovies on top are the fun element of the dish. They are such an inventive twist on the dull and flabby anchovies thrown around in the classic Caesar. Ultimately, the combination of textures in this salad is simply fantastic. The Baby Beet Salad with warm goat cheese is another superb dish. 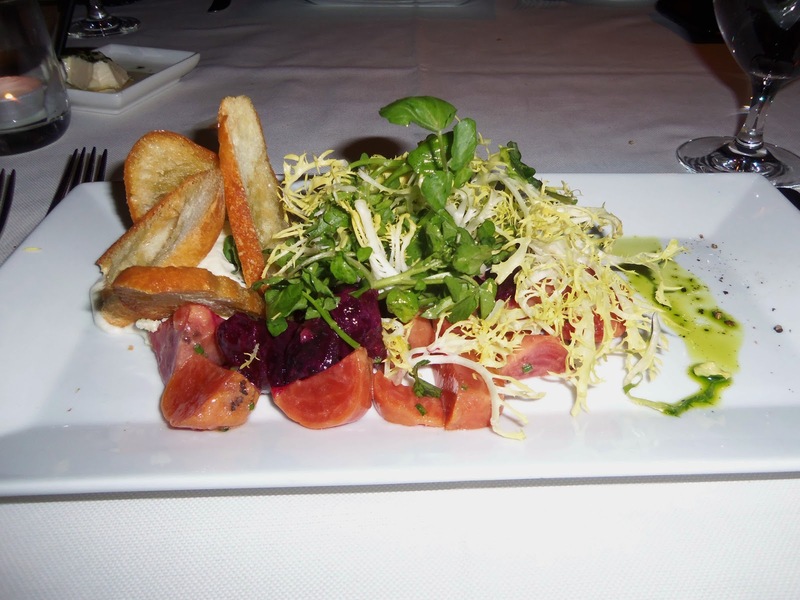 The goat cheese complements the colorful beets while the frisée lettuce lends another pop of color, crispiness and earthiness. And I should not forget the toasty bread; it’s great either smeared with goat cheese or on its own to balance out the tender beets. Coming from Romania, we grew up eating bone marrow and it’s something we simply love. So, when we see bone marrow on a menu, we have to order it; and the Bone Marrow appetizer at Botero is hands-down splendid. 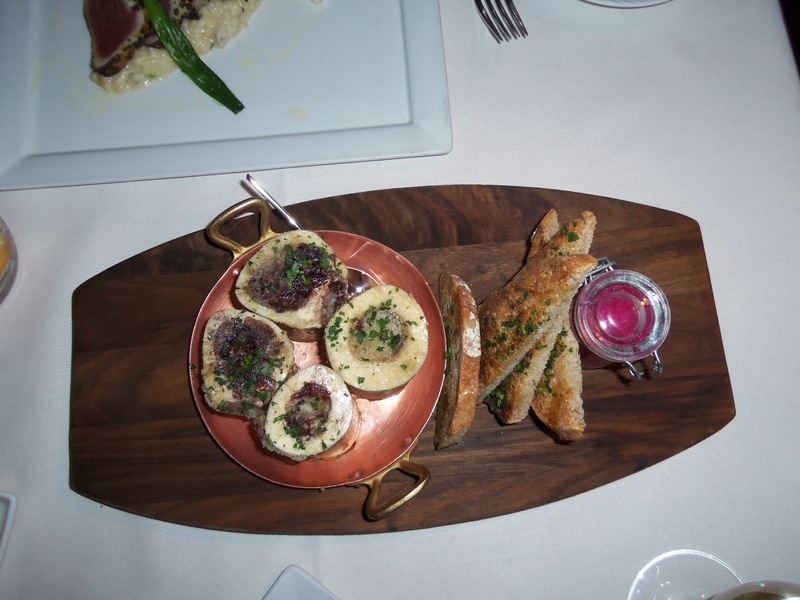 The presentation is stunning; the crusty bread adds a lovely crunch and the pickled red onions in the little jar cut through the fat and bring that much needed acidity to the whole dish. When you spoon some marrow on the toasted bread and then stack some delicate onions atop, you get this colorful, well-balanced, perfect bite. A beautiful and delicious assortment! 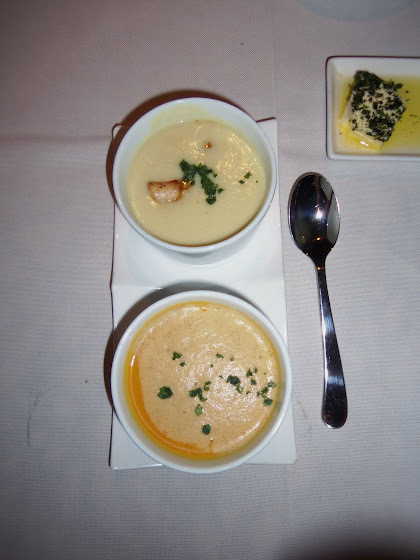 On our last visit to Botero, we also tried the Soup Tasting, where you could choose two out of three soup options. I ordered the cauliflower and baby scallops, and the kabocha squash soup tasting, while Adrian went for the cauliflower and baby scallops, and the white bean duck soup. Both the cauliflower and baby scallops, and the kabocha squash soups were smooth and creamy with the latter being a bit on the sweet side allowing the squash to shine. And the white bean duck soup was hearty and insanely delicious and was like eating homemade soup; it felt so homey and comforting. All soups were well seasoned and came in very generous, almost bowl-size cups. 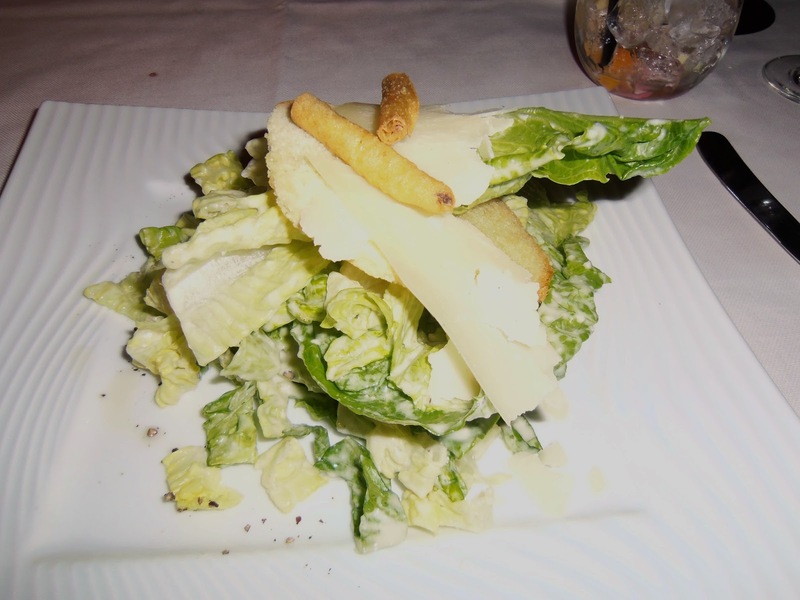 One of the things I love the most about Botero is the vast selection of amazing side dishes. We usually opt for two sides: the Wild Mushrooms and the Black Truffle Polenta with Chanterelle Mushrooms. The Wild Mushrooms are so delicate yet plump and firm to the bite, wonderfully prepared and well-seasoned. 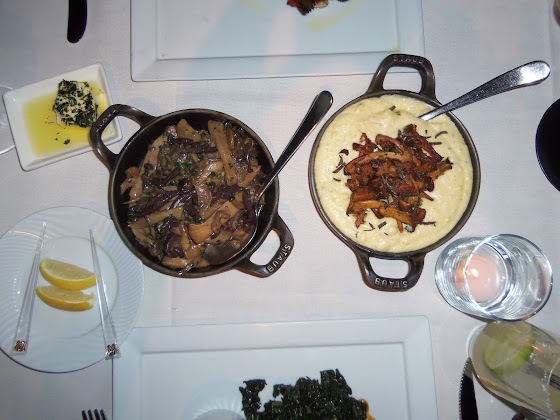 But the Black Truffle Polenta with Chanterelle Mushrooms is the star and perhaps the best dish on the dinner table. 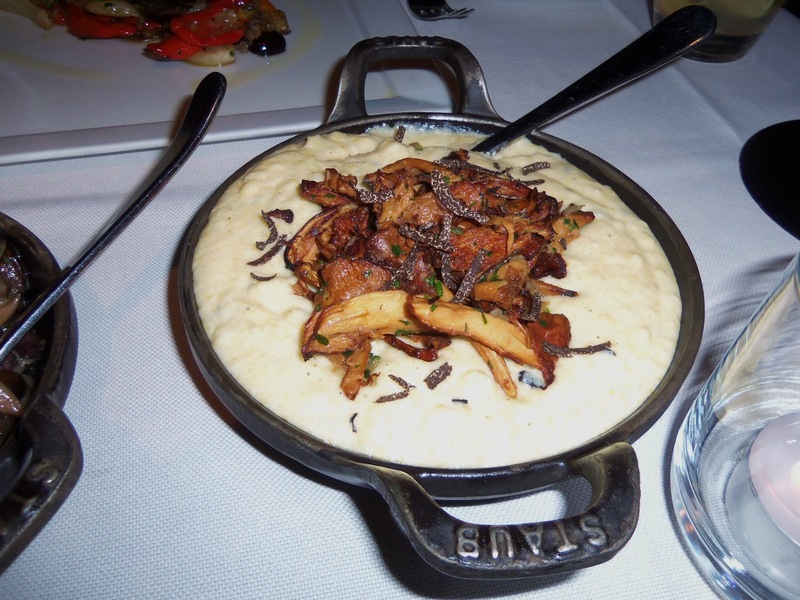 It’s rich and light at the same time and scented with the addictive but not overpowering truffle; the dish is topped with a healthy amount of beautiful chanterelle mushrooms, and finished with more shaved black truffles. So luxurious and unbelievably decadent! 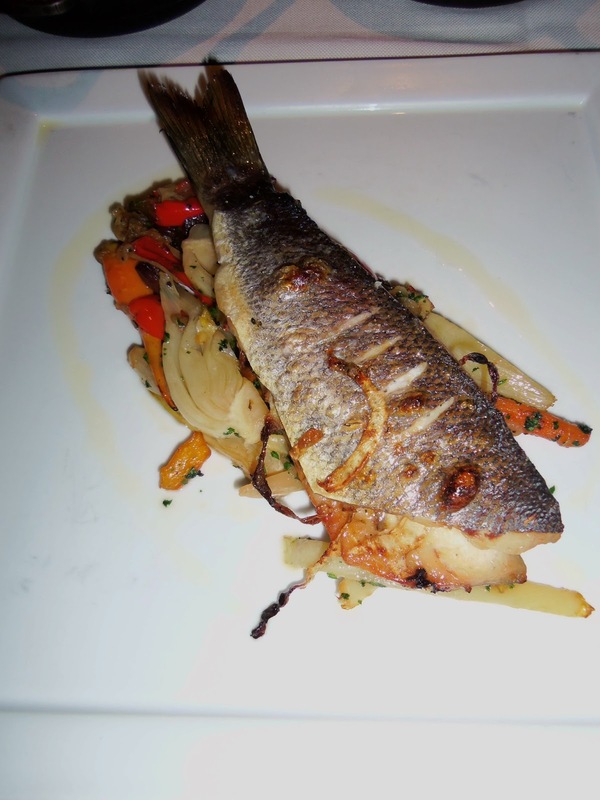 The Branzino – isn’t this the most beautiful fish you have ever seen? When it arrives to your table, you don’t know whether to admire it all night long or poke its skin and dive right in. The Branzino comes with perfectly crispy skin and tail and is gently displayed on a bed of piquant, sweet and sour niçoise vegetables reminding me of home pickled vegetables. Underneath the crispy skin, the fish is perfectly cooked, tender, flaky and so flavorful. In a word, divine! And now, la pièce de résistance: the Brioche Crusted Rack of Colorado Lamb. This is the best lamb we’ve ever had. Absolutely phenomenal; tender, juicy and melt-in-your-mouth delicious with a wonderful outside crust. 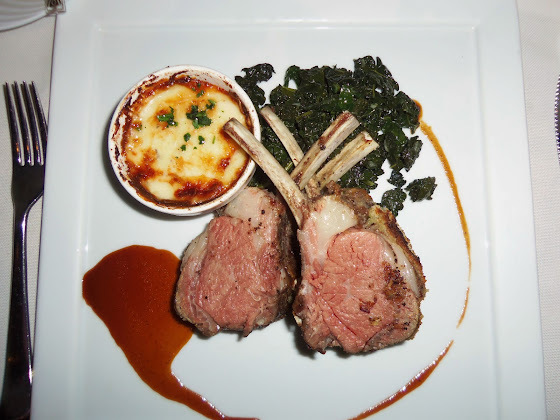 There’s one thing to keep in mind – the sides that accompany the lamb will vary by season. We had this dish twice so far and the lamb was accompanied by lamb fettuccine and green onions in the summer and by lamb lasagna and sautéed black leaf kale in the winter. Both versions were amazing and complimented the lamb very well. For an extra zing, ask for their chimichurri sauce to shower over the lamb. 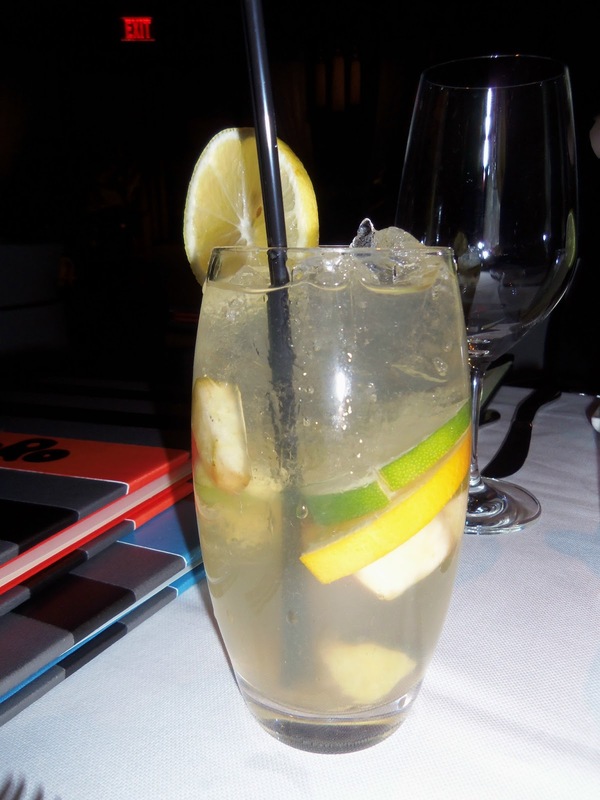 Finally, the drinks: the Botero White Sangria is sweet and fruity and simply addictive while the Margarita is refreshing, hip and so drinkable. The funny thing about our dinners at Botero is that we overindulge and are so full by the end of the meal that we end up skipping dessert. 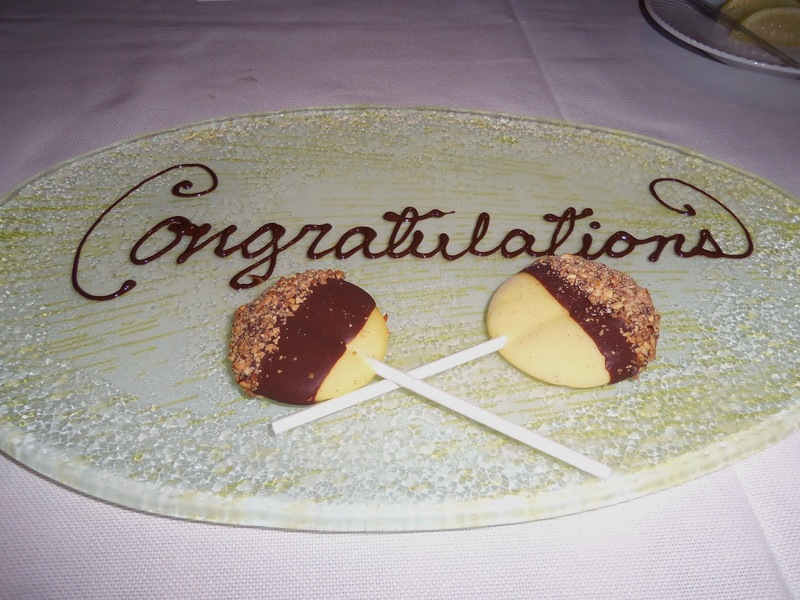 However, on one of the occasions, we were celebrating our anniversary so the excellent and attentive staff spoiled us with these cute and playful Milk Chocolate Bon Bon Lollipops with vanilla bean ice cream and covered in hazelnut praline. So good, so sweet and the perfect palate cleanser after a rich and copious meal! What else can you ask for? At Botero, you'll experience fine art and fine dining including anything from seafood to steak in a chic environment. At the end of the night, it will be an unforgettable and entertaining experience. So Las Vegas! 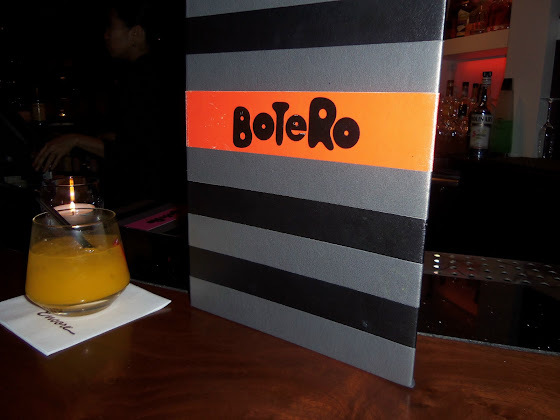 Botero serves lunch Friday – Sunday 11:00 am – 2:30 pm and dinner nightly starting at 6:00 pm.